Making rocking chairs is one of the most satisfying things I've ever done. 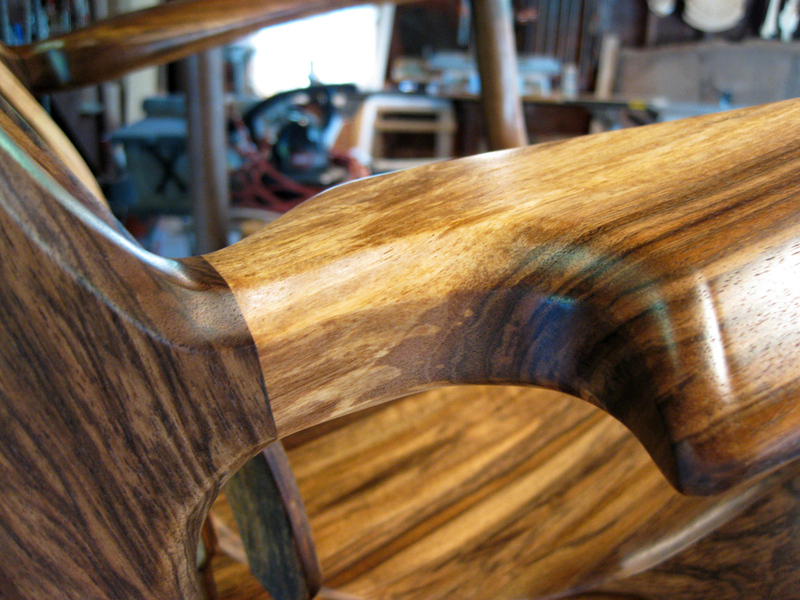 For me it is the pinnacle of woodworking as virtually every piece is curved or sculpted. Unlike most of my earlier work that was in straight planes like tables and cabinetry designed to place flat bottomed items in or on, good rocking chairs are designed to accommodate an exceptionally complex object, ie. the human body. Further complicating this issue is that every body, is different. When I first thought about making rocking chairs I remember buying some wood and then staring at it in off moments for months trying to see a chair in that wood. I came to the realization eventually that making a comfortable rocking chair at that point in my woodworking career was beyond me and it wasn't till fourteen years later that I believed I had acquired enough skills to make another attempt. Rather than reinventing the wheel and starting from scratch I decided to take a somewhat traditional approach to learning the skills I thought I needed and did a brief apprenticeship with a wonderful rocking chair maker in Virginia named Hal Taylor. 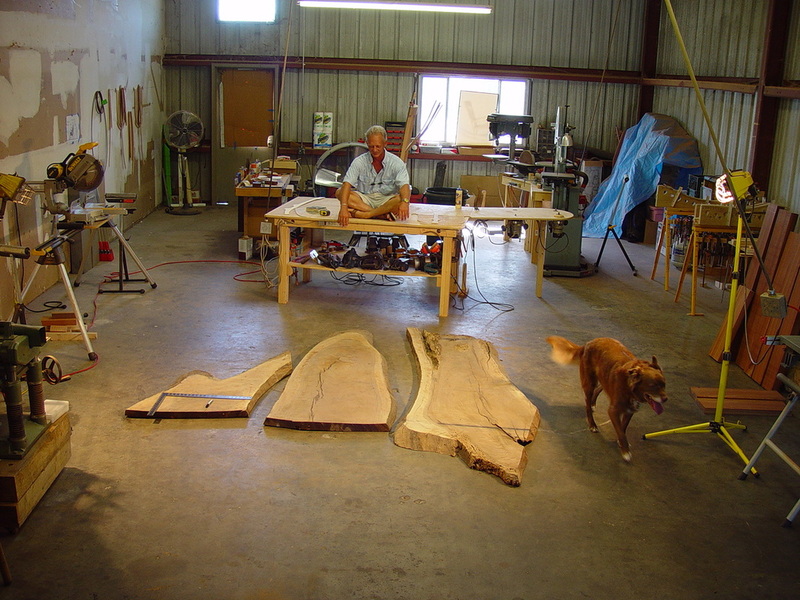 Hal had been making sculpted rockers similar in design and quality to what I wanted to make for twenty years and was willing to share his knowledge and templates freely with me. Using that knowledge as a base to work from I have been building my own chairs for the last fifteen years and through a natural evolutionary process producing a product that I hope is reflective of my personality and unique skills as a woodworker. Hal and I remain close friends today and talk and exchange ideas frequently. If you want to look at Hal's chairs you can do so at www.haltaylor.com. Hal has also written a great book on how to make rocking chairs. You can order this through his web site. I highly recommend it! I have always looked on life as a big buffet with many dishes to sample if one is intrepid enough. I also believe that no matter what your field, it is possible to bring an attitude of "excellence" to whatever it is you do. I try to do that with my rocking chairs ensuring that every chair that leaves the shop is the very best I am capable of making at that moment in time. Laying out a chair in my mind and going over how to use the wood in the best way to achieve balance, symmetry and drama. 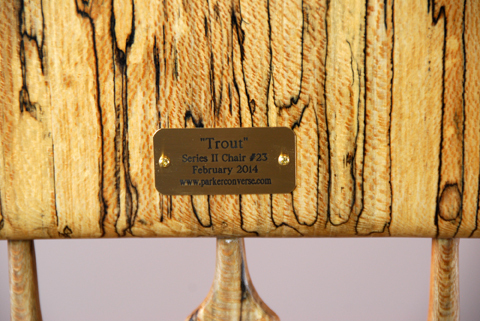 I named this chair "Trout" because I thought the wood looked like a trout.